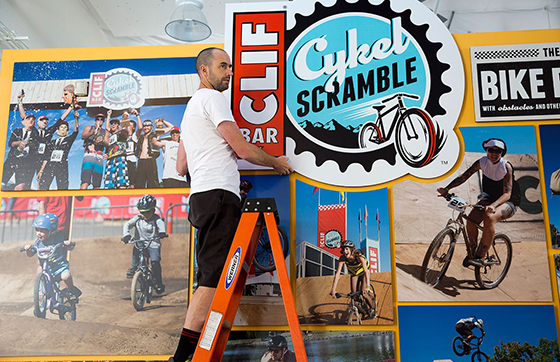 A passion for bikes originally drew Jeff Hantman to Clif Bar. He’s ridden mountain bikes since his teens. But Jeff’s other passion is art. He holds a BFA in printmaking from the Rhode Island School of Design and has been either printing, painting or sculpting for his entire adult life. These days, Jeff gains inspiration and purpose as Clif Bar’s art curator (and HR administrator) , working 30 hours a week at our headquarters in Emeryville, CA, which leaves him time to pursue his own art at his nearby studio in Oakland, CA. 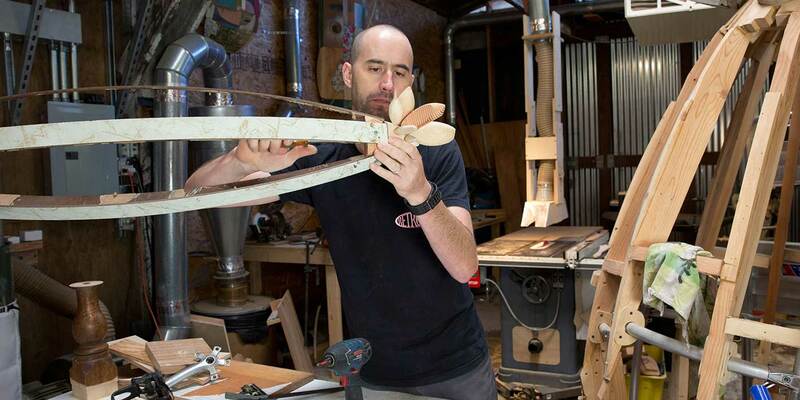 His job here was created by Clif Bar Owner and Co-Chief Visionary Office Kit Crawford, who creates, appreciates and supports art as essential to the human spirit. What do you do as Clif Bar’s art curator? The job is really two-fold. First, we use our headquarters to help achieve one of our company Aspirations of sustaining the community. We do that by hosting local art events for schools and non-profit groups. Second, we also support the community by buying, renting or borrowing work from local artists to populate the walls, ceilings and other open spaces of not just our headquarters, but our two new bakeries in Indianapolis and Twin Falls (ID) as well. What criteria do you use to select art for Clif Bar? I really focus on supporting local artists, showcasing art that fits our culture of feeding outdoor adventure, and selecting pieces that use recycled material. As a company, we try to travel lightly—to leave as little impact on the planet as possible, so I look for that in our art as well. If you come to our headquarters, for instance, you’ll see a hanging sculpture or recycled bike wheels and photo collages of plastic trash that washes up on Marin County beaches. All are by local artists. When did you start with art? I’ve been making art since I was a little kid. My mom was an elementary school art teacher in New Jersey. In middle school I took painting and pastel drawing classes after school. Art has always been a hobby for me, and it does pay here and there. 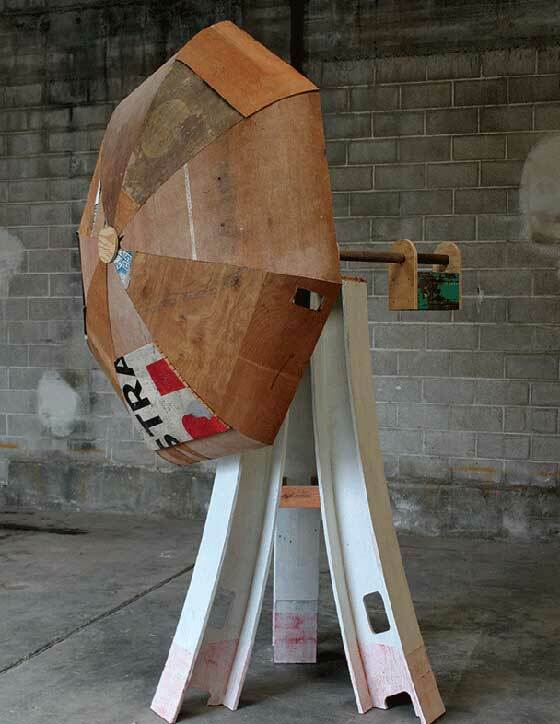 I’m a sculptor these days, primarily with plywood. I’ve been making bigger and more complicated sculptures lately. Art is something I love to do—something I have to do—which is why I never take a break from it. Do other Clif employees have passion for art? In September (2016), we held the 5th annual employee art show at our headquarters. It began slowly the first year, but now people look forward to it. This year’s submissions included digital photography, oil paintings, a handmade guitar, a pair of hand-painted Vans high-tops and a hand-knit wool sweater. I look at the show as the kickoff to one of the really exciting times of year at Clif Bar, when we also hold Lunafest and the Epiphany Ride. 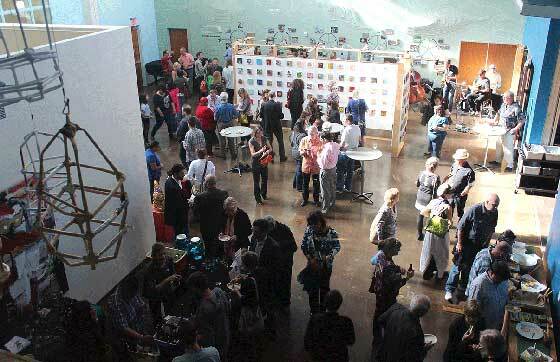 I had one person this year tell me the art show has become their favorite company event. What parts of your art curator role do you especially like? I’ve enjoyed doing the open call to artists for rental of artwork. As an artist myself, it puts me on the other side of things. It’s fun to involve the employees in selecting the artwork—they’re the jurors, and then I sit down with (one of our owners) Kit (Crawford), and we go over the results. Everything in this job is a little out of my comfort zone—like calling an engineer to discuss the load potential of wooden beams in one of our atria to see if it could hold a large hanging sculpture made from recycled bike wheels (it could). It’s stressful, exciting and fun! How do you feel about being an art curator at a company that most people wouldn’t think has one? I feel very lucky to be able to be creative in my studio, to be creative at work, and to work at a privately owned company in the outdoor industry. It checks all the boxes for me. In contacting Clif Bar years ago, I really had no idea about the company, and certainly no idea I would end up with a job like the one I have now. My job is very, very, unusual—and it’s great!